Each support group presentation includes a detailed Leader Guide with fully prepared event descriptions and learning objectives, step-by-step preparation plans, notes to leader, prompts for patient participation, facilitation ideas and what to bring. Imagine hitting a print button and having a print-ready handout with your program’s logo and contact information on it. 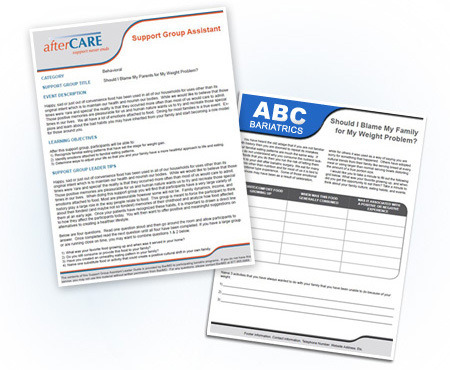 Patients will leave each event with an engaging worksheet to enhance their support group experience while having something to refer to until their next support group. This valuable resource puts you back in control by providing you with over a year’s worth of ready-made support group presentation materials. 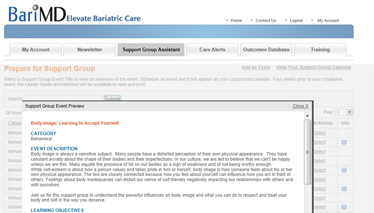 All topics are provided by experienced bariatric professionals who have the most successful support group programs in the country. Everything you need for a successful, memorable support group event. There’s value in being prepared! It has never been easier to plan months of support group in one sitting. Simply login to your account, select a support group topic and you are now ready to schedule the date and location. Record the number of attendees from the support group event in your scheduler and you now have documentation for center of excellence requirements. Each event also includes a sign-in sheet and evaluation form! Once you schedule the support group, your customized website calendar will auto-populate with the event name, description, presenter, date, time and location. 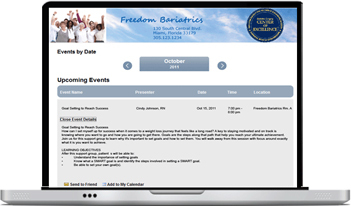 Your patients can see the postings, send the topic information to a friend and post to their calendar. Convenience with one click and you have a support group calendar! Additionally, you can use your eCalendar for information session dates with a description, time, date, registration information and location. Convenience with one click and you have an eCalendar that is always up to date! So you have selected the support group topic, date, time and location but now your patients need to know about it. Using our secure email upload feature, you can send program branded email announcements auto-populated with your support group topic, description, learning objectives, date, time and location directly to your patients. When your support group event is completed, you can use the Support Group Assistant to send follow up emails to your attendees. Communicating your support group events to patients has never been easier! Think of all the time and money saved by having this resource. It’s simple and convenient and it represents your program’s commitment to your patients’ long term success. © 2018, BariMD, Inc. All Rights Reserved.